The team Mary Berry (Tudor Musat, Iona Covei) was victorious at the UDP Open 2019. Out of Opening Government, they defeated the Opening Opposition Sciences Proles (Daniel Chouchena, Hao Juan Tan), the Closing Government 5,000 Troops to Paris (Olivia Sundberg Diez, Guillermo Serrano) and UDS please don’t start a revolution (Joris Graff, Marthe Wijfjes). The motion read: “TH as a Yellow Vest, supports attempts by Les Emergents to run for elections in European and French elections (incl. infoslide)”. The final was judged by all breaking judges with Lucy Murphy as chair as well as Emily Frizell, George Hames, Huyen Nguyen, Klaudia Maciejewska, Milla Huuskonen and Razzaq Faizal. Tudor Musat was best ESL and Open speaker of the tournament with an average of 81,60 speaker points. Best novice speaker was Daniel Chouchena with an average of 76,80 points. The CA panel of the UDP Open consisted of Sarah Tay, Benji Kalman and Antonio Fabregat with Marlyse Lissan being responsible for the tab. 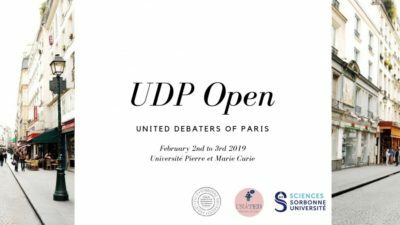 The tournament was convened by United Debaters of Paris in form of Mehdi Tomas, Marlyse Lissan, Sarina Singh, Eugénie Kotelnikova, Sui Guo, Nawa Hachem and Benjamin Le Bigot. R1: THBT European countries should change school syllabuses to disproportionally emphasis Arab and Islamic contributions to European culture. R2: THW hold the Catholic Church legally responsible for sexual abuse, harrasment and grooming committed by clergy members. R3: Infoslide: Boycott, divestment and sanction (BDS) is a global campaign promoting various forms of boycott against Israel until it agees to withdraw from the occupied territories, remove the separation barrier in the West Bank, grant full equality for Arab-Palestinian citizens of Israel, and expand the right of return to Palestinians. THBT the BDS movement reduces the likelihood of a two state solution to the Israeli-Palestinian conflict. R4: Given the technology was available, THW allow the sale of personality traits and characteristics (such as IQ, musicality and determination). R5: Infoslide: Nicolàs Maduro is the current president of Venezuela. On 23 January 2019, the President of the National Assembly and the leader of opposition Juan Guaidó, declared himself interim President. THW grant Maduro and main officials of the Venezuelan regime amnesty in exchange for handing power over to Juan Guadio. TH as a Yellow Vest, supports attempts by Les Emergents to run for elections in European and French elections.